Sometimes it is good to take a break. A couple of weeks ago I went to Flordia for a week-long vacation and it couldn't have come at a better time. I was able to relax and spend some quality time with my bestie Kirsten and do some exploring. I honestly love traveling but I am the worst at documenting it. I really wish I was able to take cute pictures in the perfect Instagram worth location in an outfit that matched to a T. But that isn't me. When I go on vacation I am bearly on my phone, the only time is usually to use the GPS or to Google good places to eat at and I love that. I have mentioned this back in this post, but if I didn't have my blog I wouldn't have any social media except Snapchat because I need to send those cute pictures of my dog to someone. With all this being said, I have been a little MIA. It always happens, I go on vacation and it takes me like two weeks to get back into the groove of things. I am just happy that the weather is changing so I feel motivated to go out and do something active. So yes, with the weather changing I can finally break out some cute spring clothes. If you read my post about affordable fashion, you'd know I have started to shop at some places I haven't shopped at a ton in the past. With H&M that was a store, I hadn't shopped at since early high school because I felt like it didn't fit my style. I went in there to find some good deals and now every time I head to the mall I stop in. 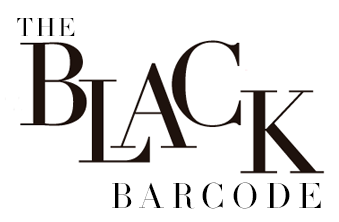 Not only is their clothing affordable, it is unique and stylish. 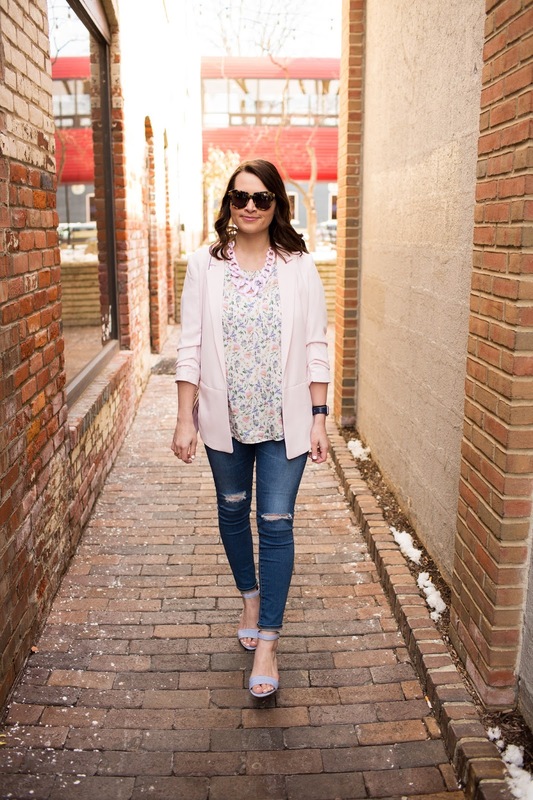 On my most recent trip I picked up this blazer that I was iffy about since the color is so bright, but the fit is amazing and I also found this top with the cute ruffle sleeves! The combo of the two are great paired together but they can be styled different ways which I love. In that affordable fashion post, I really want to start wearing my clothes in different ways to create multiple looks so I don't have to spend so much on clothing. Right now I am putting a lot towards savings (more about that in this post) so I haven't bought anything new since vacation except this pair of shoes that will get here tomorrow. Fingers crossed they fit because with this cold spring weather I don't know what shoes to wear. So that was a little update for you all. I will be having content on the blog Monday, Wednesday and Friday so be sure to check back to see new outfits. Please let me know in the comments below or via email if there are any blog post ideas you would like me to share. 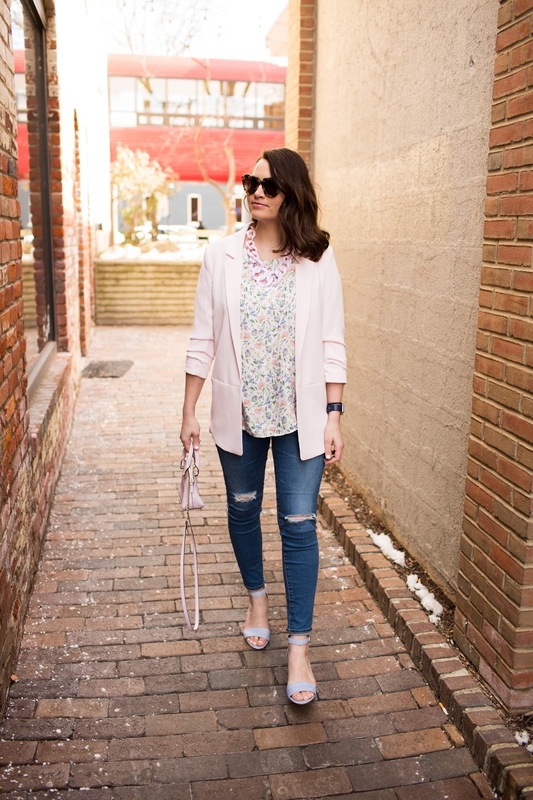 Loving the pastel colors! 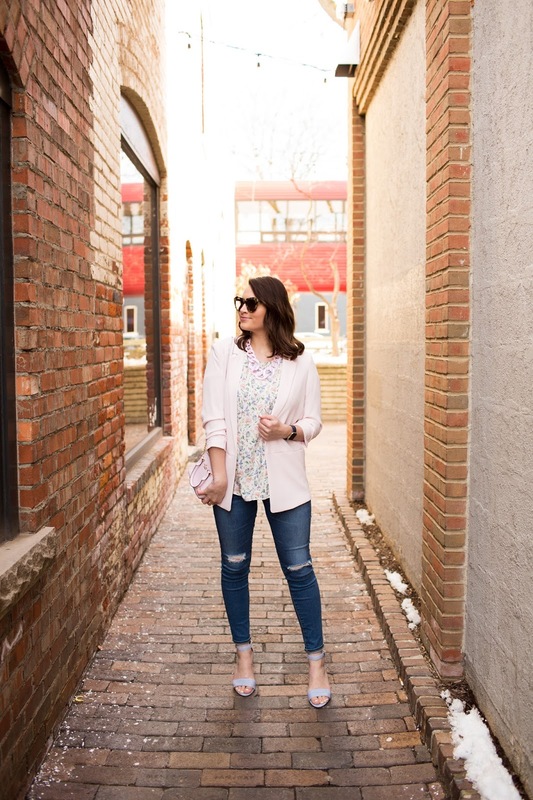 So perfect for spring:) This is such a great business casual outfit too that I could so easily wear to work! Yes, we all need a break, especially with social media. Your trip sounds amazing! I think I need one too!! 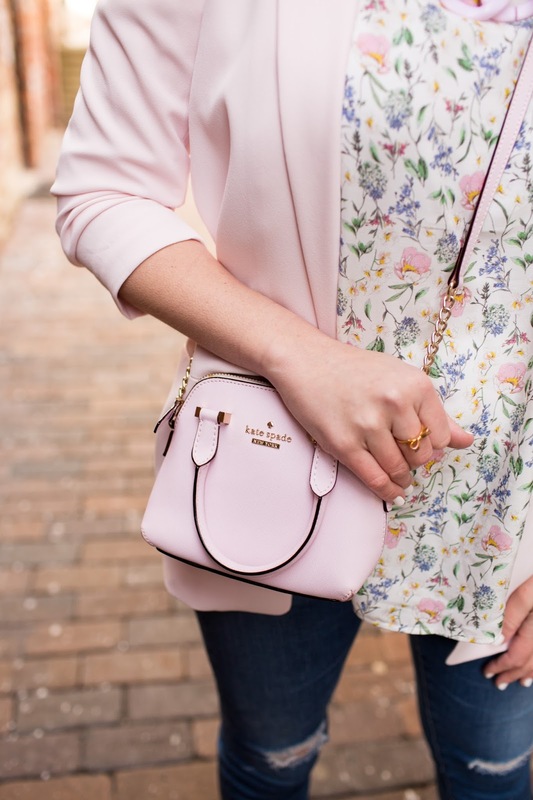 Also, loving your pretty pink pastel outfit and cute bag!! Looks like you had a good break. I am due to take one soon. 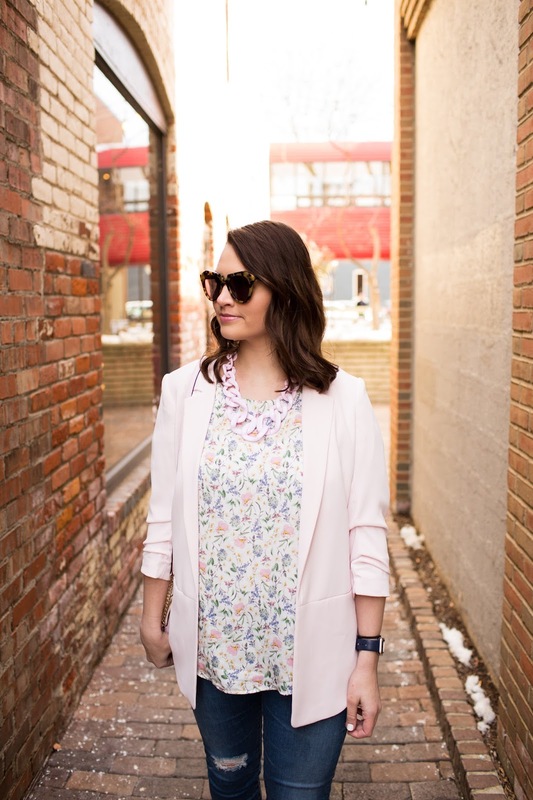 The pastels in your outfit are perfect for spring! This is totally my kinda-outfit. It's nice that you took some time off. I love taking weekend breaks from all social media. And your pastel pink and blue combo is wonderful. 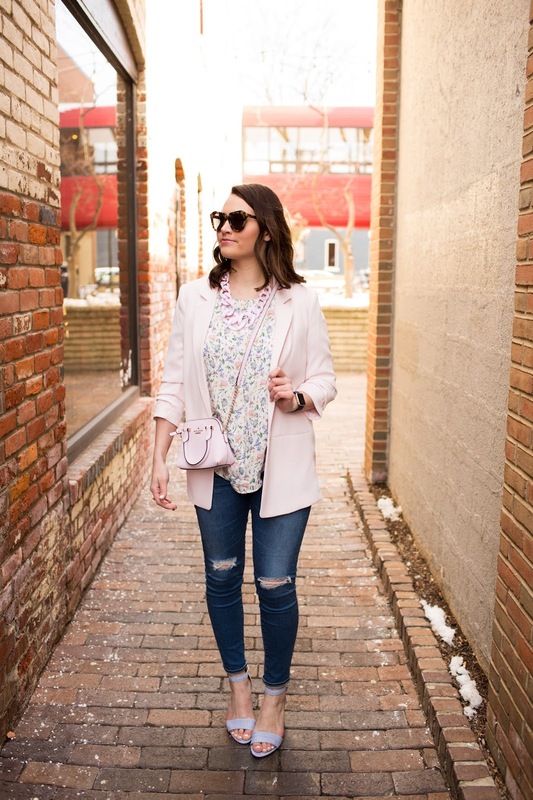 Loving this outfit, so cute for Spring! And this is the cutest little bag! Loveee how you mixed the pastel shades! Spring perfection! This outfit is like a breath of fresh air! 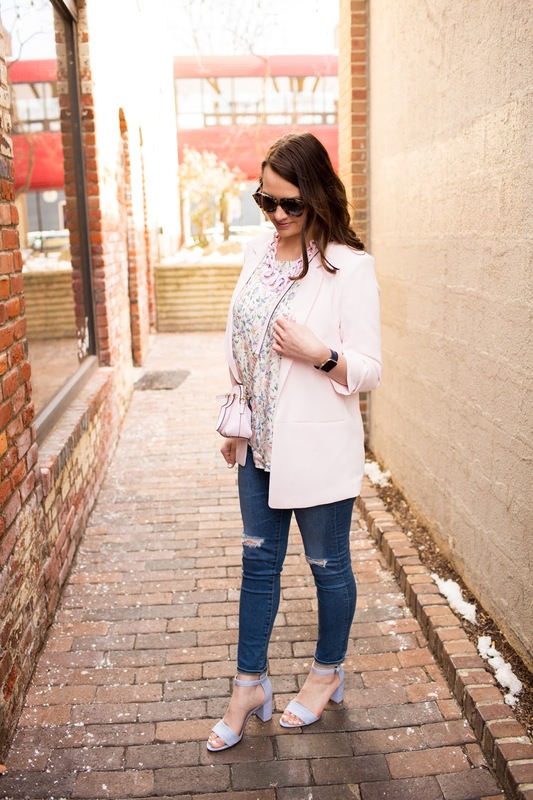 Love the top + blazer + bag combinations, and your sandals are too cute. Loving the pretty pastel tones. That blazer is so pretty. I think pastels are the cutest! I definitely love the colors of Spring. It's nice that you took a break, we all need that from time to time. Hope the shoes that you bought fit perfectly! How gorgeous are you in all this pink! So perfect for spring. Loving that bag!! It’s perfect with your outfit! !